Beautiful and pious, Anne Boleyn lent her copy of Tyndale’s The Obedience of a Christian Man to one of her ladies-in-waiting, Anne Gainford. Anne Gainford’s boyfriend, George Zouche, noticed that his beloved was avidly reading the book and tore it out of her hands. He wouldn’t give it to her back in spite of her protests and began to read it himself. Eventually the book caught the attention of the King himself. He said: ‘This is a book for me and all kings to read’. 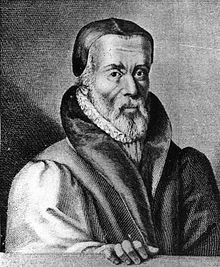 This is just one of the several fascinating legends surrounding the great Christian martyr, William Tyndale. David Teems relates these tales in an elegant and interesting style. As I love to read about Anne Boleyn, this was the one that I enjoyed best. But his biography also does the great man justice in several other ways. The most important is that Teems emphasizes the beauty and eloquence of Tyndale’s translation of the Bible, and how much it meant to him. Tyndale, born in Gloucestershire, combined the homespun Gloucestershire charm with its proverbs and sayings with the loveliness of the Welsh musical cadences to create his great English translation. He suffered over his translation, attempting to make the words beautiful but simple enough so that the ordinary man could understand them. Before Shakespeare, he wrote many phrases and words that have become part of our common English language – words and phrases that still cannot be surpassed. Teems also shows us how Tyndale suffered to achieve his aims. He endured exile, treachery from friends who turned into enemies, and he was hunted by Sir Thomas More, who wrote extremely nasty things about him. Finally, he became too trusting, leading to his death. The account of his death was too graphic for me to read, and Teems made me so sympathetic towards him that I felt that I couldn’t bear to read it! Teems also shows us that Tyndale was a true Christian man. He lived a humble life, helped the poor, and he was kind and loyal to his friends. I enjoyed this book immensely, in spite of its fairly heavy and sad subject, and my liking for Roman Catholicism. I am interested in reading more of Teems’s books.